Travel this two-lane “trail” and feel at peace with the world. This scenic and lightly used state road connects Los Alamos with San Ysidro. A favorite with locals, it’s another fulfilling one-day trip. 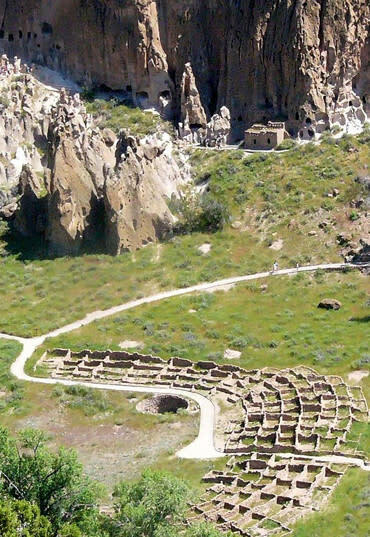 If you have time, Bandelier is well worth a visit. It&apos;s the nation&apos;s most popular national monument and combines Native American ruins and cliff dwellings with rugged Jemez vistas. Get oriented at the Visitor Center, and explore the many hiking trails and archaeological sites. Stop for a lingering look at this ancient active volcanic caldera created over one million years ago. As broad as 25 miles across, it abounds in elk, breeding birds, coyotes, and black bears. Access to the Preserve is limited; check www.vallescaldera.gov or call toll free 1-877-851-8946 for more information. Jemez Springs was named an All-America City in 1995. This peaceful valley hamlet offers a natural hot springs bath house and is home to a famous monastery. 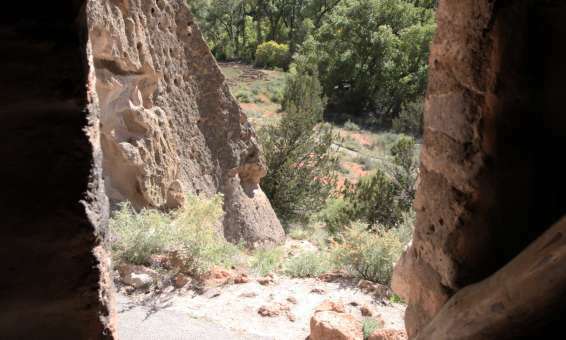 Just east of town, visit Jemez State Monument with its ruins of the Church of San Jose built in the early 1600s. And look for Soda Dam, a local swimming hole and local diving platform. Another formation, Battleship Rock, looks just like its name. You&apos;ll now parallel the Jemez River for several miles. Frequent turnouts offer picnic, camping, and fishing opportunities. A westerly detour takes you to the fascinating Gilman Tunnels, old railroad tunnels blasted out of solid rock. Further on, a short detour east takes you to the village of Ponderosa with its excellent winery. Red Rock State Park and Jemez Pueblo are your next viewpoints. The Red Rocks are famous all over the southwest, and give traditional Jemez pottery its distinctive reddish hue. The Pueblo itself offers a Visitor Center and there is several private pottery studios open to the public along your route. If you&apos;re lucky, your visit might coincide with one of several annual pueblo arts & crafts fairs held at Red Rock State Park. From Los Alamos, take NM 501, east or west, and connect with NM 4. Look for signs to Bandelier National Monument. NM State Road 4 travels through scenic canyons and densely forested hills of conifer, spruce, and ponderosa. Continuing on NM State Road 4 west from Bandelier, the first open vista is the vast expanse of the Valles Caldera National Preserve. Travel in a westerly direction down the spine of the Jemez Mountain range. Mountains bring a sense of peace and timeless beauty; the Jemez seem especially favored by nature. You&apos;ll now parallel the Jemez River for several miles. Frequent turnouts offer picnic, camping, and fishing opportunities. Proceed south to San Ysidro. This small town also offers several fine arts & crafts galleries. You may now head southeast on NM 44 to Bernalillo and Albuquerque, or retrace your route back to Los Alamos.